Because a Flickr photo and tweet I posted eventually was responded to, I debated posting this altogether. However, the lack of follow-through was unsettling enough that I am publishing this post. The first week of September was difficult for American cable network TLC. There was a hostage situation at the parent company, Discovery Communications, on the first of the month. The three hostages are fortunately safe, and business resumed as usual for Discovery Communications staffers. Around that time, though, I noticed that TLC was promoting Foursquare as Facebook within their TV programs. On multiple occasions, I noticed an overlay during their episodes that encouraged users to follow them on Foursquare with a link to a Facebook.com address. I posted to Flickr and tried my best to bring it to their attention. And I waited. Five days later, their Twitter account remained silent. I elected instead to go to their Facebook account with the hopes that perhaps my luck would be better there. I was wrong. First, their default landing tab featured an inactive promotion (which has since been pulled after I wrote yet another tweet that pointed to a Flickr screenshot of the ended promotion). I would not have been surprised if it had been inactive for quite some time. What about their Facebook wall? Surely representatives responding on behalf of TLC/Discovery will respond — minimally, they’d clean up spam. No? Beats me. (Again, Facebook was eventually cleaned up.) For what it’s worth, it was over a holiday weekend, but I occasionally see similar messages submitted during business hours that remain visible. By this point, it was evident that it was going to be difficult to reach a representative on behalf of a company about an issue that actually has some legitimacy. There’s a clear error in their promotion and they aren’t acknowledging the issue. In fact, during the time I sought them out, it became evident that the TLC Twitter account was wholly automated, with tweets promoting their new season premieres. So I went to their website in search of some way to contact someone. I couldn’t find a contact form. I even tried accessing their press page, only to be told that I’d have to request an account to get access to legitimate contact addresses. At that point, I gave up and powered up WordPress. TLC made many missteps when it came to their social media marketing efforts. Most importantly, it seems like their engagement plan of action is totally haphazard and that they’re participating in shiny toy syndrome. Fortunately, it’s time for everyone else to get some takeaways from their misfires. Heck, perhaps TLC will come by and ramp up their social media efforts. It’s so desperately needed. First and foremost, let’s lay down some ground rules. Social media came to being recently mostly because individuals from all over the world realized that they can congregate online — for free — to talk about things that they’re passionate about. As domain names and web hosting got cheaper and cheaper, it was easy for individuals to build communities that they loved and that would help like-minded folks meet each other. Before long, social networks became hugely successful, and savvy marketers realized that they could create accounts on these networks to promote themselves. Whether they’re big or small, it’s almost an equal opportunity for every business or brand to get involved in the social media space (as a note, many small businesses are doing this better than TLC right now!). In the last few years, as social media has grown in popularity, so too has the desire for more and more companies to get involved. However, many of those companies are still gripping onto the traditional roles of an earlier era. Today, we’re in a many-to-many relationship. It’s not a one-to-many relationship. You need to do a lot more than broadcast to succeed. It’s not just media. It’s social media. You need to be prepared to converse with (and not just speak to) your constituents. If you’re not ready, don’t put your social media presence front and center on your website. Better yet, start watching how other people are doing it and start listening to what’s actually happening in the space. Following the previous point, automation is a pretty big sin in the world of social media. Plus, quite frankly, it’s offensive. If I see you on social media channels, it’s because I want to speak to you, not a shadow of something you stored to your account six days ago and queued up for the weekend. You can’t automate social media, and while it’s very compelling to do so, if you’re a big brand, we can tell. I’m not saying you should never automate. However, who really just builds up a Twitter or Facebook and lets it churn out content on a daily basis without any oversight or manual interaction? If you’re a company like TLC, that means people will tweet at you and you won’t reply. That means someone could post the worst pornographic image you’ve ever seen on your company’s Facebook wall and you wouldn’t know about it until you’re in the office the next day, at which point you open it up and get fired when your boss, who just so happened to have been walking behind you, sees that NSFW content. That means something catastrophic may occur and you won’t know until days later because you did your social media duty for the week. That’s not how social media works. As I said earlier, “Remember, engagement is key.” TLC might be lucky that they’re a big brand and already have an audience, but some of those individuals in their audience do know when to spot a company that doesn’t get it. Here’s to you, TLC. It’s not advisable for any student to hand in a paper to his teacher without having proofread the document for any egregious mistakes, grammatical or conceptual. It’s not advisable for a company to promote a video campaign with a video that shows a typo in the company’s URL. It’s not advisable for me to publish this post without rereading and seeing if there’s anything I need to edit. Every time I publish a post, I proofread it at least a dozen times. Review everything before it goes live, especially if your target audience is thousands or millions of people. I’m not sure how many people or departments saw that TLC Foursquare/Facebook overlay before it was “sent to our TV screens” (quote out of the Jack Bauer playbook), but I’d imagine that at least a few eyeballs merely glossed over it. Don’t just gloss. Pay attention. Social media is pretty public facing and therefore should be considered serious business if you want to be taken seriously. Review everything carefully and be diligent about your involvement. If you’re not interested, it becomes clear to us that you don’t care about us and just think of the social media space as “just another space to leverage.” The word “leverage” here is not a positive term and should be considered synonymous with “exploit” and “manipulate.” If you care, your efforts will be obvious. Otherwise, you’re just insulting your followers. One of the goals of social media is to put the human back into business. Instead of being defensive, admit that you messed up. Say you’re sorry. Trust me, people will forgive you if you’re wrong and admit to your blunder rather than cover it up. After I had written most of this post (but right before I published it), TLC replied to me defending their stance with the Foursqaure/Facebook promotion. I was told that the “mistake” about the Foursquare-Facebook promotion was legitimate, since they were polling users on Facebook to find places where Foursquare badges can be given — yes, read that again. I’m not convinced. Wall posts get pushed down pretty darn quickly, which would mean by the time you discovered that overlay on TV, you’d go to the Facebook page and wonder what the heck Foursquare was. In fact, the screenshot above with all the spam shows that that Foursquare status update was nowhere to be found. Perhaps they DID have a landing page that I never saw (though I don’t believe they did), but the overlay also said “Follow TLC on Foursquare” (not shown above) and Facebook isn’t Foursquare any way you churn it. Plus, when I saw it, that landing page — if it existed — was long gone. I may be totally insensitive here, but TLC did screw this up, and when I replied explaining this the rationale I had behind what seemed to be an illogical promotion, I was met with silence. It’s been over a week now and I figured now’s as good a time as any to publish this post. I wrote most of this article over Labor Day. It’s my holiday just as much as it is the holiday down there in the Discovery Communications headquarters in Silver Spring, Maryland. Xobni recently released a report showing that we check our email all the time. The report surveyed over 2,200 adults and found that many are dedicated to their work. I don’t know if TLC is dedicated at all to their social media efforts. I do see many other companies doing this right, though. When it comes to social media, you need to be responsive. Queuing up messages is fine if you mix that with other engagement, especially when their concerns necessitate a response. Tuning into what your customers are saying or simply monitoring the channels (especially when not doing so can harm your brand) is required of you. Otherwise, why are you here? I’m totally sympathetic to what happened at TLC’s headquarters, especially since the office was apparently closed after the situation, but you don’t have to be physically present in the office to be practicing social media. (And if your office is really closed, perhaps saying happy birthday to a follower and ignoring more pressing matters during that time isn’t advisable.) Unfortunately, this is a huge change in culture for many people — it’s not a 9-5 task anymore. My specific concern is a minor issue in the grand scheme of things, but PR firestorms can break out if you don’t reply quickly. (Remember Motrin Moms?) In this day and age, you need to be monitoring your brand all the time especially if you have some sort of social media presence. If you have a Twitter page, monitor when people tweet about you and ask for more information where necessary. If you have a Facebook page and someone asks an important question, respond to the individual, even if to say “I’ll look into it. Thanks for your support!” The bottom line is that you should let your customers know that you’re listening. It shows them that you care. That’s a big paradigm shift and companies are still confused about doing that right. When all else fails, nobody should try to hunt for a contact number or email address that they still haven’t found after 20 minutes. Make it easy. Install a CAPTCHA if you’re worried that you’ll get more email than you can handle. Sometimes the emails being sent to your attention are actually important. It was very unfortunate to hear what happened at the Discovery Communications headquarters earlier this month. However, this should not be a reason to stop, drop, and disappear. In the IT world, it’s always great to have a disaster recovery plan in place. For most business with physical locations, it’s important to have an evacuation plan in place. In the social media world, it’s also imperative to have an emergency preparedness plan in place. In the event of emergencies, someone should be designated to run the public relations and oversee all inbound and outbound communications. While a legitimate emergency might cause business closures in single or multiple office locations, the rest of the world is still awake and some might be demanding of your attention. While my specific concern might be minor in the grand scheme of things, the lesson here is major: if something is going wrong, it’s better to communicate effectively than not at all. At the end of the day, TLC is making a respectable effort, and while so many companies are doing a better job than TLC, TLC isn’t doing that bad a job either. However, they do need to improve and be on top of their game if they are to be taken seriously. The biggest thing social media did for many companies was make them approachable again. It’s what human businesses do. Thankfully, there are hundreds — maybe thousands — of companies that are getting it right, but there are still companies that need to play catch-up. It’s not too late. You really summed everything about social media up here. You are absolutely right about automating social media and that is what most companies do nowadays. Being social is about relating with people and it is not possible for me to meet a friend and be telling him about my services evertime we come across each other. Social media is there for a purpose, and that purpose is to be able to connect and interact with each other. Concerning proofreading, I am always seeing the need to proofread my articles everyday and it’s amazing to hear the number of times you proofread your articles – a lesson to be learned. Proofreading is kind of why I ended up posting this altogether. I spent a few hours on Labor Day writing this post, polishing it up, and then received an email from TLC the next day where I replied with “maybe I won’t publish the blog post I’d been writing — I’ll just send it to you directly if you want it.” (I received no reply.) I was so emotionally invested in the article so I decided to put it up since there are important lessons to be learned. Good on you for posting this article! That’s what they get for ignoring you. Also it is really good to bring this topic some attention, social media should not be automated. It’s basically like a one sided conversation when everything is automated. It’s like those people who talk and talk and talk, but as soon as you respond it’s like they’re not even listening. I hate that. Thanks so much for posting this Tamar. We social media types like to focus on the PR disasters, but in many ways, this is where the bulk of companies who haven’t laid out a social media plan find themselves. Not necessarily in a PR nightmare due to handling social media poorly, but instead hurting their brands and their relationships with their customers through smaller social media missteps they don’t even notice unless someone like you points them out. You simply held a mirror to what they’re doing, and now hopefully they’ll hire you to improve themselves. The FourSquare/Facebook issue is at best a confusing promotion. Seems odd to ask where to put FourSquare badges anyhow. Yup, I hope it was an educational experience! I have to say, though, asking on Facebook for Foursquare badges is definitely an interesting idea. It simultaneously promotes the community of TLC’s viewers while also calling attention to a new social network. However, I have yet to see where this even happened. Thank you for your thoughtful comments about social media and specifically about TLC. There are a lot of good reminders in your post about the importance of dialogue and engagement by brands on social media platforms, and as a company, we are continually looking for ways to enhance our use of social media to connect with our fans. I’d like to address a few specific comments in your post. First, while some tune-in tweets on @TLC are automated because we have programs starting in multiple time zones every evening, the majority of our tweets are posted by a living, breathing person. If you go back through @TLC’s tweets just over the last few days, you will see RTs, questions and sharing of links, all done in real-time. Second, regarding spam – this is an issue that we face across all of our networks. We could employ someone full time just to sweep our Facebook pages and delete spam, and it would still continue to appear. We do our best to control it, but like any social media team, sometimes it gets the best of us. We hate it, too. Finally, we do monitor and interact on our pages on a 24/7 basis. It may not appear that way on any particular page, but we have many Facebook pages and Twitter accounts across our networks, so if we’re not posting on one of those at a given moment, we’re likely doing it somewhere else. One of the few exceptions, which I’m sure all can understand, was when we took a few days off after the incident at our headquarters building two weeks ago to regroup and heal. Thank you again for the comments. We’re listening. First of all, thanks for responding so promptly. I understand that tweets are posted by a living, breathing person (usually!). My specific highlight here was that most of it was automated during this time, and more specifically, the items that were *NOT* automated were mentions of “happy birthday” and then some. It did look like a lot of the content was automated, and you’re entitled. But having a full automated feed — which is what it looked like for awhile — is my big concern here. Regarding the spam issue, yes, I totally understand. The highlight here was more about it being several hours before it was cleaned up. I face this too, and I understand that you’re doing the best you could there. This is a great case study on how companies need to engage their social media landscape. All companies and marketing agencies need to read this and follow these simple yet important requirements if they plan to be in social media. Ooo la la….I like this post! I have people who ask me all the time about automating because they “don’t have time” (a problem we all have). I say it’s OK…but it’s not set it and leave it. Ignoring a comment is just like ignoring an email or voice mail. With all of the ways that comments can be forwarded to email, keyword tracking and on and on, there’s no excuse for ignoring comments. I love that TLC heard you AND responded! Great job!! Yup — TLC’s effort is definitely honorable. Their approach needs work but I’m happy to see they are willing and able to improve! We have used automated Twittering, but are backing away from it–but one thing we have done it to always have several points of daily interaction. Set it and walk away is skipping the ‘social’ in social media and it misses the whole point. I believe that many businesses don’t see an immediate revenue stream from SMM, so they set it up and get it rolling automatically, and it’s back to business as usual–I have to admit, sometimes it’s difficult to see the SMM forest through the trees! So true — you won’t actually see social media returns if you’re not working aggressively at it. If TLC has so much spam to combat in so many social media arenas, why not just choose the setting on FB to only let people post to the “Just Others” page and not to the main page? There’s nothing I like less than visiting a company’s FB page just to see a lot of ramblings from random people. I come there to see what the company’s thinking. If I want conversation, I go to the Just Others or Discussion page. Making this step would increase the quality of the TLC FB page astronomically. That’s a good question…I personally like seeing a mixture of voices but I hear your point! I have almost 7000 fans of my business FB page – and I love the community interaction. But I like to be in control of it 🙂 My page gets a fraction of the traffic that TLC’s does, and when I went there just now sure enough someone had posted a spammy “make money now from home” message on the Just Others page. Even if I caught those pretty quickly, which I usually do, people visiting my page would still see them and they look terrible. I find that plenty of people respond to my updates on the main page – and I’ve never had a spammy comment left under one of my own updates. It seems that spam posts are usually original posts, not comments left in reply to mine. So keeping others people’s original posts to the Just Others page really cuts down on how much spam people see, while still giving everyone a chance to interact. Yup — I hear you. There are some pros and cons to both options, that’s for sure! May be the corporate businesses have their own influence of being in the corporate cultures. Hence the reason we see more robotic style of presentation whose ultimate base is a “commercialized target”. Leaving the part of suggesting about social media marketing, I think we first need to have human awareness/face. Hi Ash, yes, that’s definitely the case. But that’s what social media is all about. In The New Community Rules: Marketing on the Social Web, I write about this entire paradigm shift that social media is about being human again, not professional to the extent that you don’t have a face. That’s what the social media marketing movement is *all* about. If you’re not ready for that, you’re not ready for social media. You can’t be social if you’re unwilling to smile. Hey nice post! You can tell you really put some heart into this. For such a company who focuses on people their social media plan wasn’t implemented with the same focus. But they’re getting there, and that’s really important. 😉 Thanks for commenting, Kyle! I tried to contact you via the contact tab, but the captcha image is not showing up. Might there be another way? Glad that’s straightened out. Thanks Laura! Thanks for the post! Social media is and will always be about engaging and being responsive. At time, I still have to refer back to your book “The New Community Rules”, as a reminder. 🙂 woohoo, I’m happy to hear that, Nan! Indeed the do & don’t do when it comes to Social Media. Good read. I think it’s important to take pride in all of your site’s pages. I try to make sure all of my site’s links are accurate and working. I see it on occasion where people have broken links on their sites or cut of sentences in their tweets and it turns me off. I want to feel like they have enough pride in their product to maintain it properly. That’s so true. But sometimes, you can make a misstep. A few months ago, someone told me that all the photos on my blog post died. It wasn’t even me; it was a script that polled my CDN that had a buggy upgrade, thereby killing thousands of URLs. I ended up having to manually update more than 200 blog posts. Life was good. Things can definitely happen like that! But on the other hand, there can be gross oversights that are a lot more public facing. If anything, it means you need to get a LOT of people on the issue. I know Discovery is hiring for social media folks, and I hope they’re not done! But as you said, the problem is if people can cope with the massive workload you get with upkeeping a social media account. It can be very overwhelming for those who arent prepared. Perhaps those who automate decide that they can cope better if they have automated aspects to their blog, but its not really the case is it? Great points. Yeah, it’s kind of harder to keep up if you’re automating, hmm 🙂 Ah, the challenges of social media! WWhat a great stuff on your blog, I started last year trying to create blogs for profit and to learn social media and Marketing. I am going to continuing following your blogg , looking forward to get better on mine. I have a passion for Gshock watches so I am creating a site that reflect that, and I also want to help other people reviewing products and help them with the content. Now I am too new on this and I am relying on peoples tips. proof reading is a great tip!!! you nail that!! I messed my RSS feed title on my new blog , I have to fix it!! It is a awesome post, you had listed everything here and I also feel that some companies use automatic services to use these services. 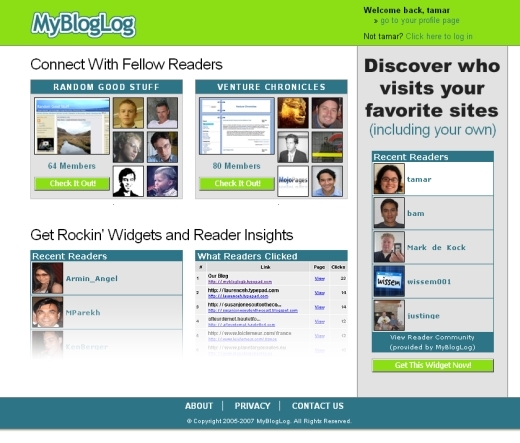 By joining MyBlogLog communities, users are essentially creating their own blogrolls. So do they still need blogrolls on their sites? I would say that it’s not necessary.